6869 137Y 80 Pfg. Posthorn with very rare watermark-variety \"4 Y in lieu of 4 W\" and horizontal gum rippling, fresh colors and very well perforated, from right margin of sheet, in perfect condition mint never hinged a nearly always missing issue! Photo expertize \"the quality is perfect\" Hans-Dieter Schlegel BPP. 6870 138 90 Pfg. 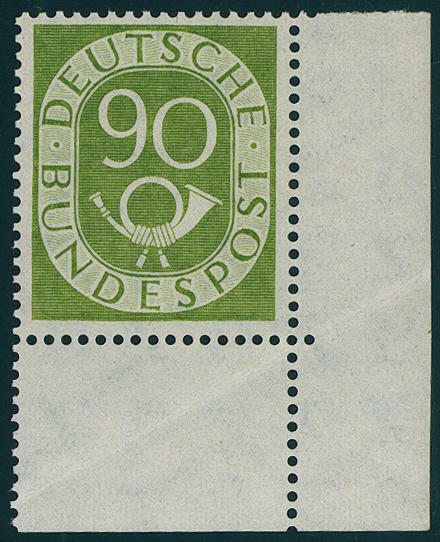 Posthorn, a wonderful block of four, fresh colors, unfolded, in perfect condition mint never hinged, expertized Schlegel BPP. Michel 3200,- €. 6871 138 90 Pfg. 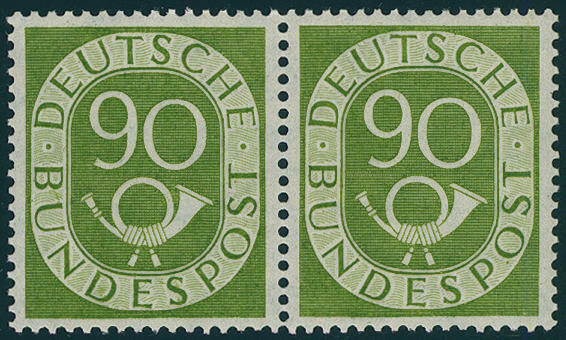 Posthorn 1952, horizontal pair, fresh colors and very well perforated, in perfect condition mint never hinged, without any signs. Michel 1600,- €. 6872 138 90 Pfg. 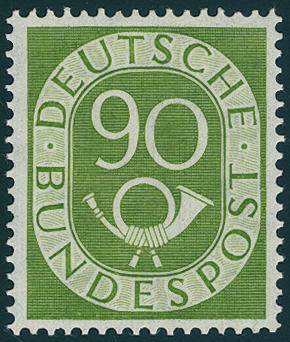 Posthorn 1952, horizontal pair, fresh colors and very well perforated, in perfect condition mint never hinged, without any signs. Michel 1600,- €. 6873 138 90 Pfg. 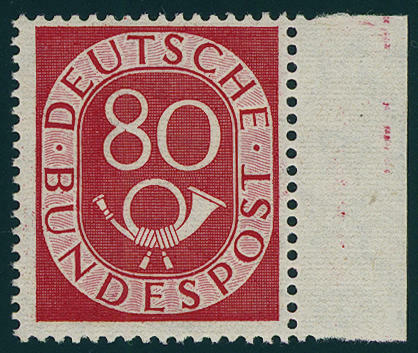 Posthorn from of the right lower corner of the sheet, fresh colors and very well perforated, only in the margin meaningless slight trace of crease, signed on the base Schlegel BPP. 6874 138 90 Pfg. 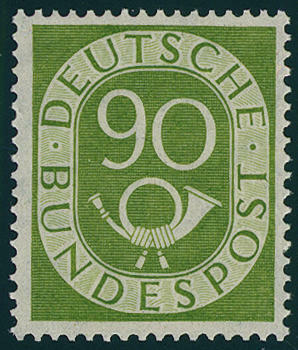 Posthorn from of the right upper corner of the sheet, unfolded, in perfect condition mint never hinged, without any signs. 6875 138 90 Pfg. 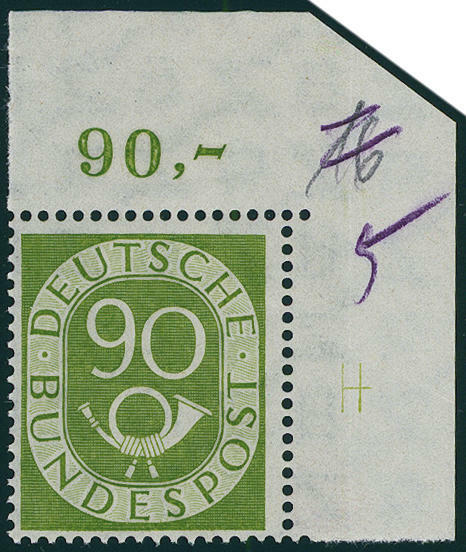 Posthorn from left margin of sheet with marker cross on margin to facilitate cutting or perforating of panes, fresh colors and in perfect condition mint never hinged, unfolded, without any signs. 6876 138 90 Pfg. 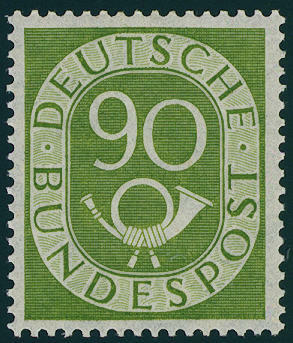 Posthorn, in perfect condition mint never hinged, expertized Schlegel BPP. Michel 550,- €. 6877 138 90 Pfg. 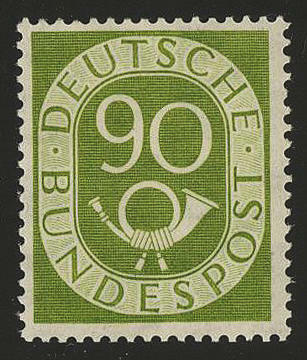 Posthorn, fresh colors and in perfect condition mint never hinged, expertized Schlegel BPP. Michel 550,- €. 6878 138 90 Pfg. 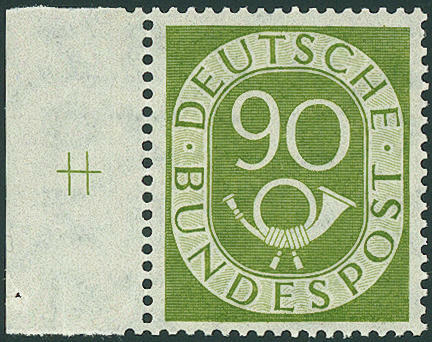 Posthorn, fresh colors and in perfect condition mint never hinged, expertized Schlegel BPP. Michel 550,- €. 6879 138 90 Pfg. 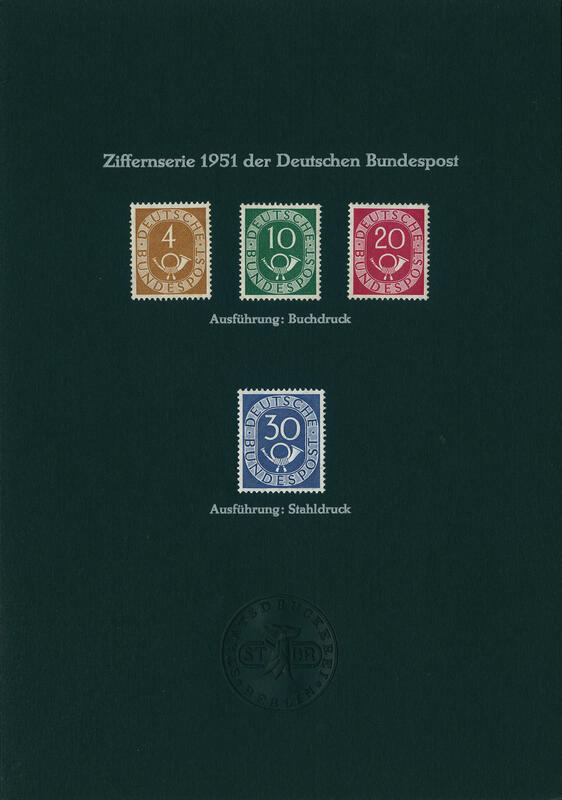 Posthorn, in perfect condition mint never hinged superb item, expertized Schlegel BPP. Michel 550,- €. 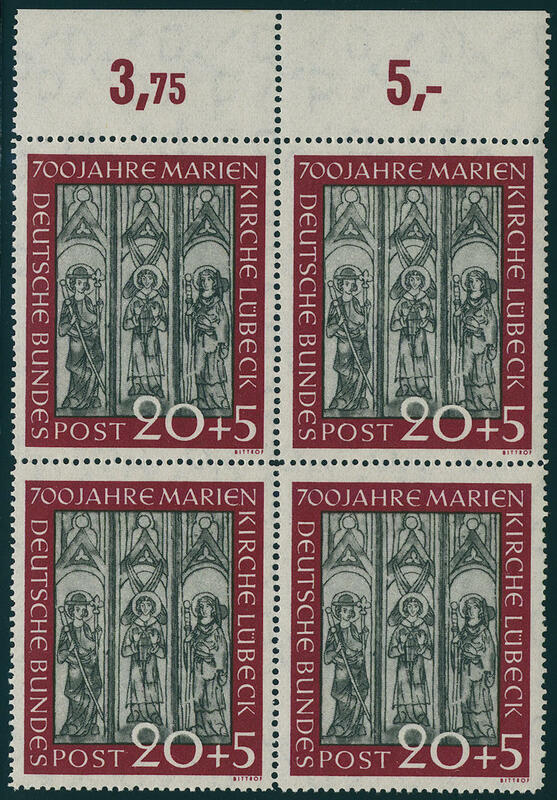 6880 138 90 Pfg. 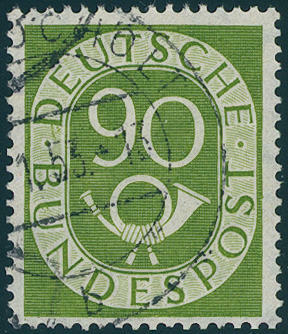 Posthorn fresh colors and in perfect condition mint never hinged, expertized Schlegel BPP. Michel 550,- €. 6881 ⊙ 138I 90 Pfg. Posthorn with very scarce plate flaw \"diagonally line through right part the posthorn cord\", neat cancelled, photo expertize \"the condition is perfect\" Andrew Schlegel BPP. Michel 1200,- €. 6882 ⊙ 138II 90 Pfg. 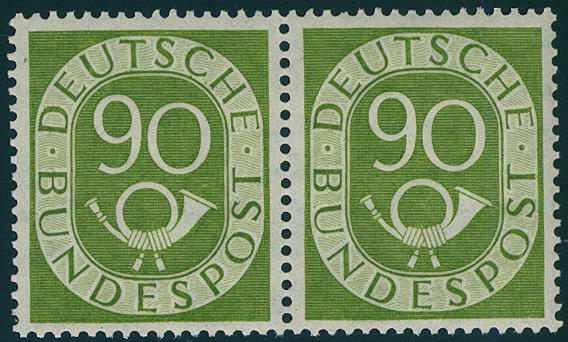 Posthorn with scarce plate flaw \"two green lines at the bar of the D from German\", neat cancelled this plate flaw comes only in a small part of issue before! Michel 800,- €. 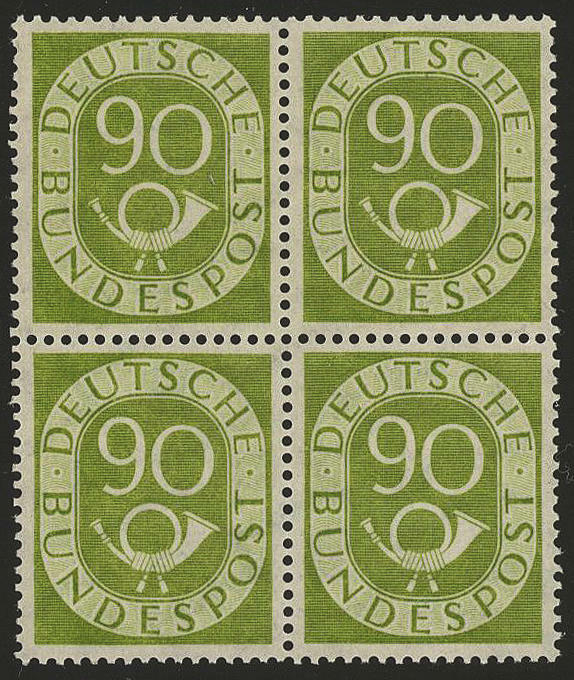 6883 ⊙ Ak2 Posthorn, black announcement carton with white inscription and embossed seal the Federal Printing Office Berlin with the denomination value 4, 10, 20 and 30 Pfg. Michel 1000,- €. 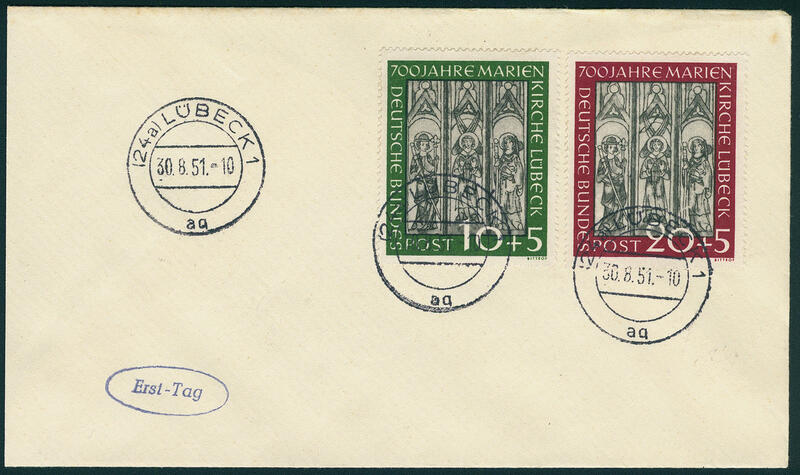 6884 139/40 St. MaryÂ´s Church 1951, block of four set from upper margin, unfolded, in perfect condition mint never hinged, without any signs. 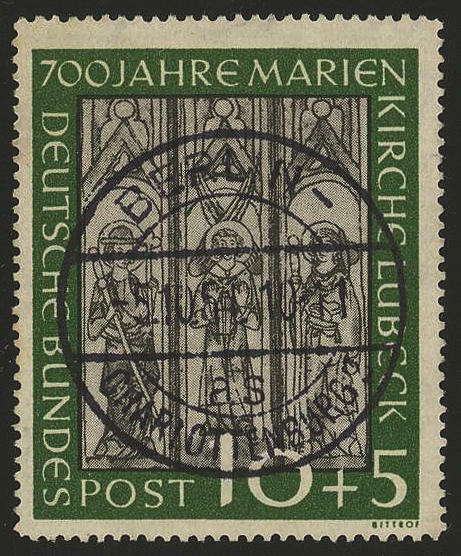 6885 ⊙ 139/40 St. MaryÂ´s Church 1951, uniform centric and neat cancelled \"BERLIN-CHARLOTTENBURG 5.10.51. \". A lover set! Expertized Schlegel BPP. 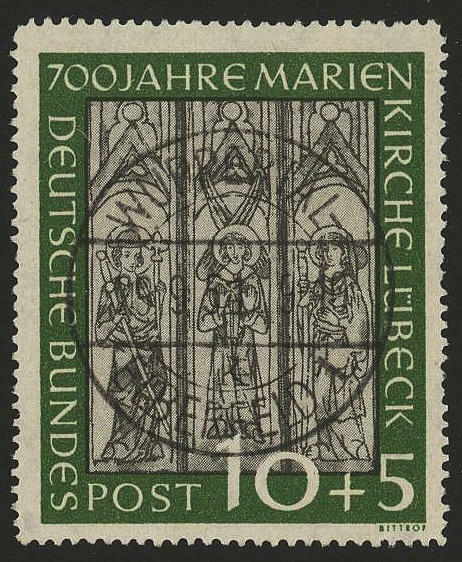 6886 ⊙ 139/40 St. MaryÂ´s Church 1951, uniform perfect centric cancellation \"WUPPERTAL-ELBERFELD 24.9.51. \". Lover set! Expertized Schlegel BPP. 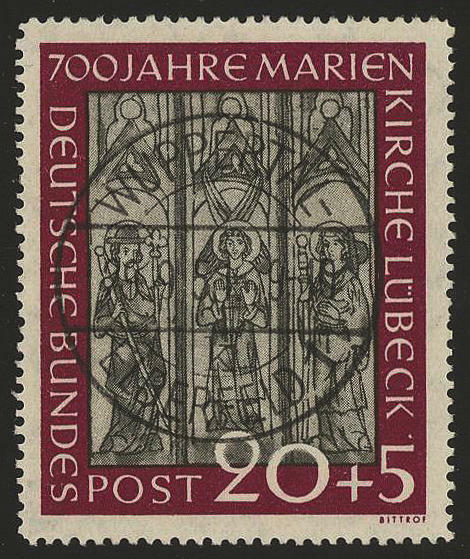 6887 FDC 139/40 St. MaryÂ´s Church 1951, fresh colors and in perfect condition on decorative First Day Cover with clear first day cancel \"LÜBECK 30.8.51. 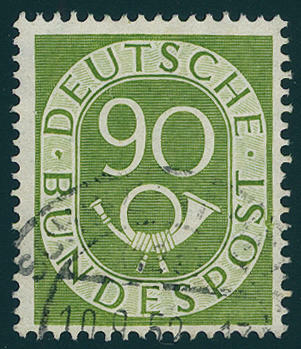 \" to Bad Kreuznach. A scarce issue! Expertized Schlegel BPP. 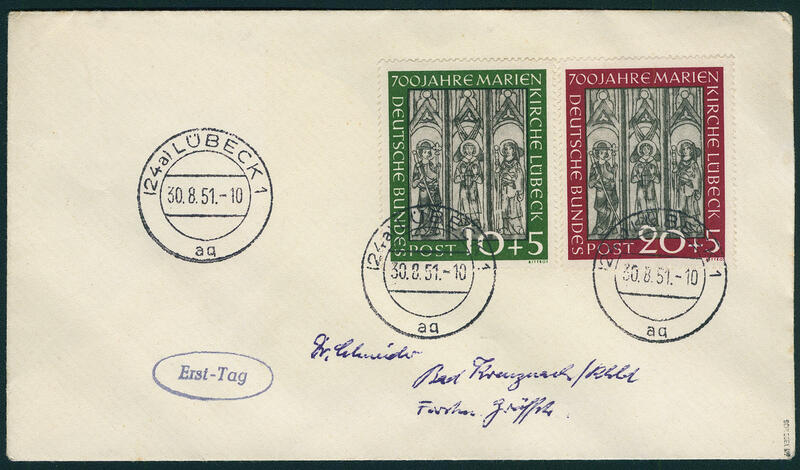 6888 FDC 139/40I St. MaryÂ´s Church 1951, both values fresh colors and in perfect condition on very nice, unlabelled white First Day Cover from \"LÜBECK 30.8.51. \". As well the 20 Pfg. 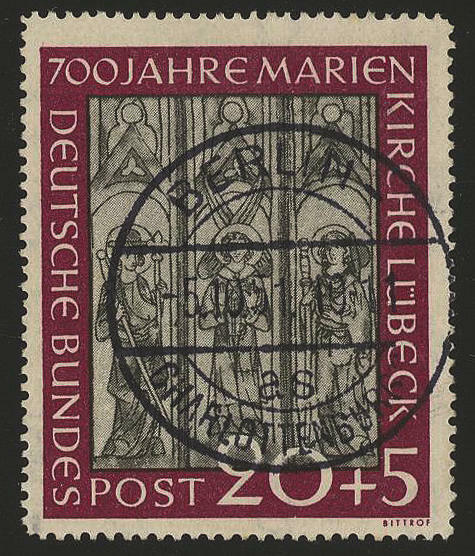 With scarce plate flaw \"crack in the middle fresco\". 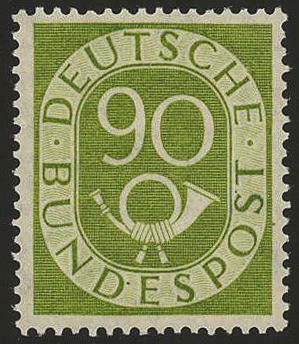 In this kind a spectacular rarity of the Federal Republic. This is the first time, that we a First Day Cover with this plate flaw offer can. Even in the enormous special collection of Mister Bennewirtz was a such document missing. Photo expertize Schlegel BPP.